"What, you think just because you are wearing a captain's uniform, you're in charge?" 3 3/4-inch scale action figure of Leonard Hofstadter from The Big Bang Theory. Exclusive Leonard cosplaying in a yellow Starfleet Captain's uniform! Figure has 5 points of articulation & includes pop-out diorama packaging. Entertainment Earth Exclusive! With this detailed Bif Bang Pow! 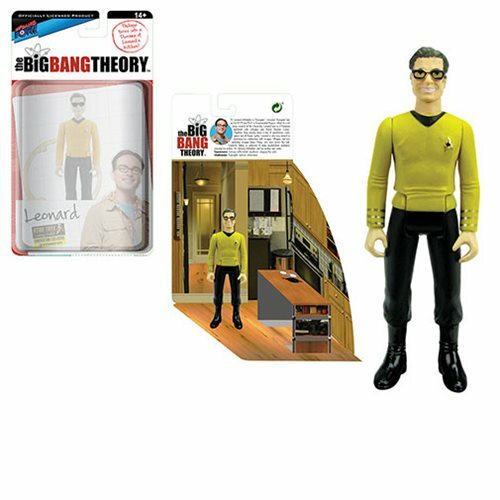 The Big Bang Theory / Star Trek: The Original Series 3 3/4-inch scale action figure Leonard Hofstadter, the experimental physicist is sporting the same style gold and black Starfleet uniform as one illustrious captain did before him. This authentically rendered figure of Dr. Hofstadter is "set to stun!" Dr. Leonard Hofstadter is "Everyman" – provided "Everyman" has an IQ of 173 and Ph.D. in Experimental Physics. When he's not doing research at the University, Leonard lives in a Pasadena apartment with colleague and friend Sheldon Cooper. Together, they proudly share a love of superheroes, video games and all things "geeky". Leonard is also very earnest in developing his relationship with on-again, off-again, but now definitely on-again fiancé Penny, who lives across the hall. Leonard's family is composed of many accomplished academics including his mother, Dr. Beverly Hofstadter, and his brother and sister. Superpowers: Solving differential equations, playing the cello. In The Big Bang Theory, Leonard and Sheldon are brilliant physicists – geniuses in the laboratory, but socially challenged in the real world. Enter beautiful, street-smart neighbor, Penny who aims to teach them a thing or two about life. Despite their on-again, off-again relationship in the past, Leonard found true love with fiancé, Penny. Even Sheldon has found a female companion – entering into a "Relationship Agreement" with neurobiologist Amy Farrah Fowler. In their free time, Leonard and Sheldon continue to enjoy frequent trips to the comic book store and fantasy role-playing games with their ever-expanding universe of friends, including fellow scientists Raj and Howard, and Howard's adorable microbiologist wife, Bernadette. THE BIG BANG THEORY™ Crew Boldly Goes to Comic-Con as Action Figures! The Big Bang Theory/TOS Bernadette 3 3/4-Inch Figure - Excl. The Big Bang Theory/TOS Sheldon 3 3/4-Inch Figure -Con Excl. The Big Bang Theory/TOS Howard 3 3/4-Inch Figure - Con Excl. The Big Bang Theory/TOS Penny 3 3/4-Inch Figure - Con. Excl. The Big Bang Theory/TOS Raj 3 3/4-Inch Figure - Con. Excl.